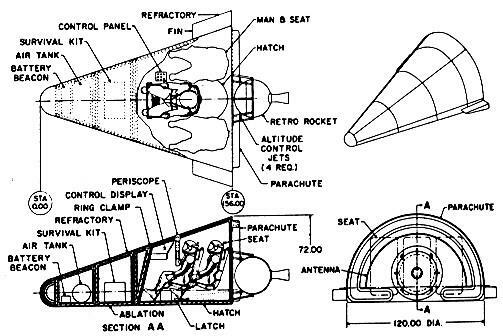 American manned rescue spacecraft. Study 1960. Three crew lifting re-entry capsule. Orbital escape - no abort capability. Mass per crew 434 kg. Status: Study 1960. Gross mass: 1,303 kg (2,872 lb). Height: 5.17 m (16.96 ft). Span: 3.96 m (12.99 ft).